Every once in a while pop culture icons converge. 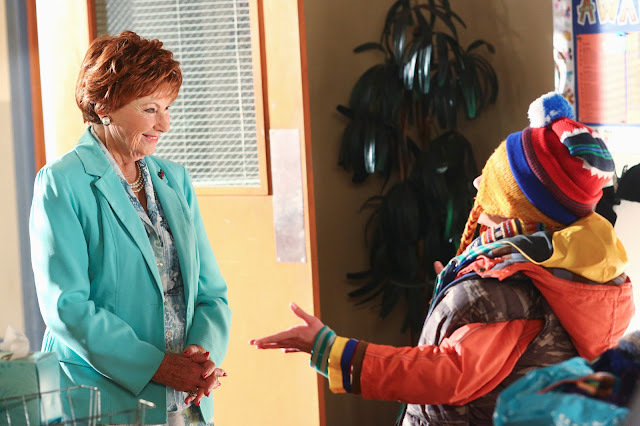 Such will the case tonight when Marion Ross, who played Happy Days iconic mother Mrs. Cunningham, appears on the modern family sitcom The Middle. Although she won’t be going head-to-head with the Heck matriarch, Frankie, she will be lording her Vice Principal powers over Brick. But Marion Cunningham also didn’t do the heavy lifting that Frankie does. “I don’t think I ever vacuumed or did anything hard like that,” Marion pointed out. Luckily, this week there’s an obvious choice. Tune in to the season finale of The Middle tonight at 8 p.m. EST/7 p.m. Central on ABC.